Located on top of Taman Puncak Selatan in Precinct 5. Near the Sports & Recreational Precinct of Putrajaya and waterfront developments. Culmination of the main axis that runs from Perdana Putra building with houses the Prime Minister’s Office, to Dataran Putra, along the main boulevard & major public squares & across the bridge over the lake. Takes its shape from the eye of the pending perak with the main halls set in the eye of the pending perak. Shape of PCC is round. 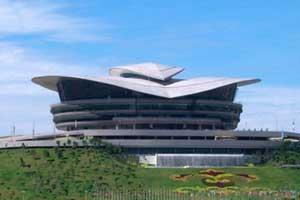 To alleviate the plain roundness of the structure, the structure roof is designed like a folded origami. The layout where the various areas / rooms are set in a series of radiating circular uses with the Plenary Hall, Head of States Hall and the Banquet Hall set at the center or eye of this circle. It takes the shape of the wau bulan (moon kite) & the pending perak (silver royal belt buckle), with the main set in the “eye” of the pending perak. The Banquet Hall is 4347 sq m & can seat a maximum of 4,500 cocktail styles & 2,000 banquet styles. The Head of States Hall is 518 sq m & can seat 184 theatre style. Car parks – 1,200 bays provided. Two (2) basement levels for car parks. Top floor is the 4th floor & houses all mechanical & electrical rooms. The 3rd floor is a ring of public galleries; pre function spaces, service areas & a VVIP lounge. The 2nd floor has pre-function areas, meeting rooms, a delegates’ lounge, a gallery & a viewing deck. The Head of States Hall on the ground floor is surrounded by VVIP meeting rooms & lounges. The lower ground mezzanine floor has meeting rooms, a reception area, staff canteen & administration & maintenance offices. The lower ground floor – meeting rooms, a restaurant, a cyber cafe, the banquet hall, a kitchen, other, halls, service rooms, a business center and a loading bay. From Southbound: through KL-Seremban Highway, Bandar Baru Salak Tinggi & North South Highway. From Eastbound: Kajang Bypass, Jalan Sungai Ramal, KL Seremban Highway & Bangi. By train – KTM Commuter, Star, Putra LRT & KLIA Transit. What is Nasi Lemak ? · 'Nasi' means rice in Malay, while 'lemak' means rich. , its name is a Malay word that literally means 'rice in cream'. · Traditionally the rice is wrapped in banana leaves although some have now taken to selling it in microwaveable plastic containers. · At its best, this dish is served in a banana leaf wrapping. Unfold the leaf to discover a portion of fragrant rice that's been cooked in coconut milk, some fried anchovies, a slice of plain omelette, some fresh cucumber and the all-important sambal (a paste made from chillis, dried shrimp and spices). · Originally a Malay dish, it is prepared by the Chinese & Indian too, who added on many accompanying ingredients such as fried chicken wings, sausages and vegetables. · Traditionally, this comes as a platter with cucumber slices, small dried anchovies, ( Ikan Bilis), roasted peanuts, stir fried water convolvulus (kangkong), hard boiled egg, pickled vegetables (acar) and hot spicy sauce (sambal). · Nasi lemak can also come with any other accompaniments such as prawns, chicken, cuttlefish, cockle, beef curry (beef stewed in coconut milk and spices) or paru (beef lungs), shrimp, chicken gizzard, even chicken floss, etc. · Street vendors often sell Nasi lemak bungkus which are parcels or wraps containing the nasi lemak. Tables are set up with various containers filled with an assortment of the accompaniments and customers pick what they want to accompany the pre-made parcels of rice. Why is it cooked this way ? · The sambal - Sambal is cooked oil-soaked sweet chilli (both dried and fresh chillies are used) paste in pounded shallots, garlic, belacan (shrimp paste), sugar, salt and tamarind juice. 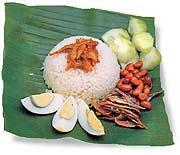 · The egg - Traditionally, nasi lemak is ate with sliced hard boiled egg. Some nasi lemak is served with whole or pieces of omelette. Some with purse-egg with liquid yolk (sunny side up with yolk on one side, before yolk harden, fold the other half over it). · Slices of cucumber are served along with nasi lemak. Preferably crunchy fresh cucumber, which helps to sooth your swollen tongue once in a while. · Fried peanuts and crispy anchovies are a must. Sometimes, the peanuts and anchovies are packed separately to retain their crispness. When do Malaysians eat this food ? · Nasi lemak is traditionally a breakfast dish, and it is sold early in the morning at roadside stalls in Malaysia, where it is often sold packed in newspaper, brown paper , waxed paper or banana leaf. However, many more upmarket restaurants now serve it on a plate for the noon or evening meals. · More and more people are starting to have nasi lemak at night instead of in the morning. · it’s available on almost every street corner and in many restaurants, and nowadays even in some supermarkets and other food shops such as delis. & cafe. Basic pack of nasi lemak costs from Rm1.00 to RM 2.50, and if we add a portion of meats, it can go to about RM6.00. It much depends on where we have Nasi Lemak, which is more economical at the street stalls compared to at restaurants. At hotels, a serving of nasi lemak generally costs from around RM20,00 upwards. Nasi lemak come with many accompaniments will cost more than a just simple combination of rice, sambal, half boiled egg, fried anchovies & slices of cucumber only. Bok House, located on Jalan Ampang is probably one of the most visible yet least remembered relic of early KL. Part of the original millionaires row, the home will probably be best remembered as 'Le Coq d'or' (The Golden Cockerel), a small restaurant and bar which florished in the early 60s and continued to run until the house was closed to the public in 2001. Chua Cheng Bok came to Malaya as did so many of his compatriots, fleeing the hardships and the War Lords of Imperial China. They dispersed throughout the Nanyang, the South Seas, seeking their fortune. Today they constitute the unique force of the “Overseas” Chinese to be found in just about every country in the Asia Pacific, a diaspora bound by their “Guan Xsi” long before Western business coined the word “network”- and becoming known as the Jews of Asia. Chua Cheng Bok no doubt arrived here in a somewhat unseaworthy craft - alone without benefit of education, money or kin. The migrants were received and given shelter by the Chinese Clan Association, usually in the crowded shophouses around the old Market Square. Sinkeys the local populace called them. This is how the First Ancestor of so many of today’s thriving Chinese corporations started life. Their aim was to found not just a business but a family business - a family fort ress. The only security the migrants could find in a land of strangers lay in material wealth. Thus the Overseas Chinese came to represent the mercantile class faithful to the commercial instincts of their race when the bamboo curtain of Communism closed off China itself to the outside world. For Chua Cheng Bok it was Bok Housebuilt in 1920 - along Ampang Road, that we know better today as Le Coq d’Or. The choice of name is again curious,its origins unknown, and invariably mispronounced as “Lay Coq d’Or” - French was not taught in the local schools. It was a long and hard journey from Market Square to Bok House. Cheng Bok first got a job in a shop selling spices.But this was not enough. It filled the rice bowl but would never amass the capital, however modest by today’s standards to supplement his income, and that he needed to start a business. But having several hours left in the day he took himself off to “Red Light Corner” at the junction of Ampang which was lit at night to prevent any traffic colliding in the dark. Chua Cheng Bok used the lamps that had been installed to mend overnight the vehicles of that era – cycles and carrrages. Cheng Bok’s break came when he heard of an Englishman up country whose tin mine was going bust and who was about to sack his workers and return to England. He took over the ailing mine. He was probably fairly well acquainted with tin mining since Kuala Lumpur was founded on it. Tin mining activity was concentrated in lower Ampang a kind of unruly, Wild West - or Wild East community in those days. The Colonial Government having allowed in the migrants to develop the tin and the rubber industries then proceeded to ignore them. They established their own system of law and ord e r, which the origin of that special species - the Capitan China. Cheng Bok could not pay his tin workers but gave them accommodation and food with the promise of profit sharing if things came good – a frequent practice in Chinese business. The mine prospered and Cheng Bok and his brother were able to found a business in Singapore and Malaya. Cheng Bok called it Cycle and Carriage as a mark of gratitude to its humble origins. A postscript to the story is that he voluntarily paid the English tin miner, now in England, a pension for the rest of his life. The symbol of his success came with his building Bok House to which there is romantic legend attached. It seems he wished to marry a rich man’s daughter form one of the houses down Ampang. But the father did not consider him good enough because of his lowly origins. To impress him or to spite him Cheng Bok, when he in turn joined the league of wealthy Chinese, built an even grander house across the road. Bok House became part of the Chinese Heritage of Kuala Lumpur. Le Coq d’Or the restaurant was opened in1958 and operated 43 years till 2001 when sadly it was closed. Now thanks to a quirky clause in Chua Cheng Bok’s will, Bok House stands empty, its fate unknown. But Cycle and Carriage flourishes. Location: Next to National Monument - Parliment Road. 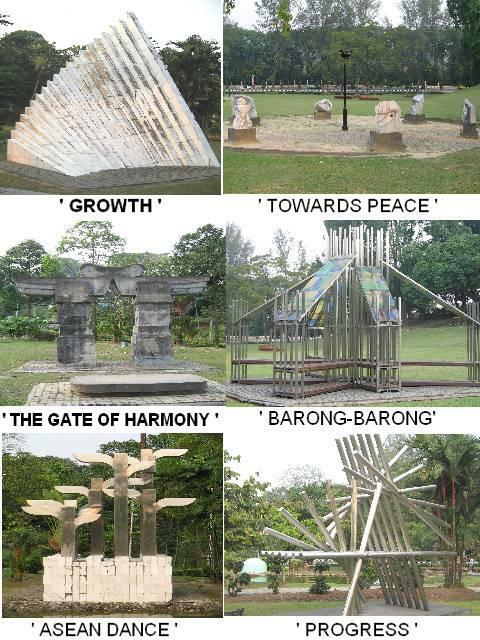 · The ASEAN Garden comprises of 6 sculptures from Indonesia, Singapore, Thailand, Brunei Darussalam, Philippines and Malaysia. · It was officially opened in 1987 to commemorate the 20th anniversary of ASEAN (the Association of South-East Asian Nations). · It represents unity and co-operation amongst member nations and the sculptures symbolise the rich culture and tradition present. Concept: The twenty slabs arranged in a curving movement from a low profile to the 'tumpal' "shape pointing" upwards, symbolise the dynamic growth of the ASEAN region during the first twenty years. Material: Malaysia marble slabs on reinforced concrete. 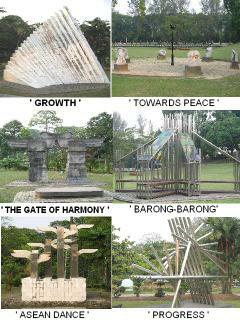 Concept: The six sculptures symbolise the progress in growth, unity, peace and harmony of ASEAN. Concept: The Gate symbolises communication among ASEAN countries. Separate wings and pillars represent the interdependence of the nations. The concrete block in front of the gate symbolises the nations will create communication and conference among the nation will create harmony. Concept:A modern interpretation of old type architecture existing in the whole of ASEAN region. This must be used as a bed, toy, table and chair to actualize interaction among people. Concept: Stainless Steel is an industrial material which emphasis’s the industrial progress of ASEAN. Stainless steel pipes, despite their limitations, can be handled in a creative manner and made to look beautiful. Concept: To preserved the old and welcome the new. Nyonya is a distinct form of Malaysian cuisine that evolved with descendants of the intermarriages of Chinese immigrants with the local population in Melaka over 500 years ago. It all began in the early 1400s when the great chinese explorer Admiral Zheng He (Cheng Ho) and 27,000 men arrived at the Malaccan port (Melaka). According to legend, some of the men liked the land so much that they stayed, fell in love and formed marriages with local Malay women. Their decendents became known as Peranakans (Malay for “born here”) or Straits Chinese. 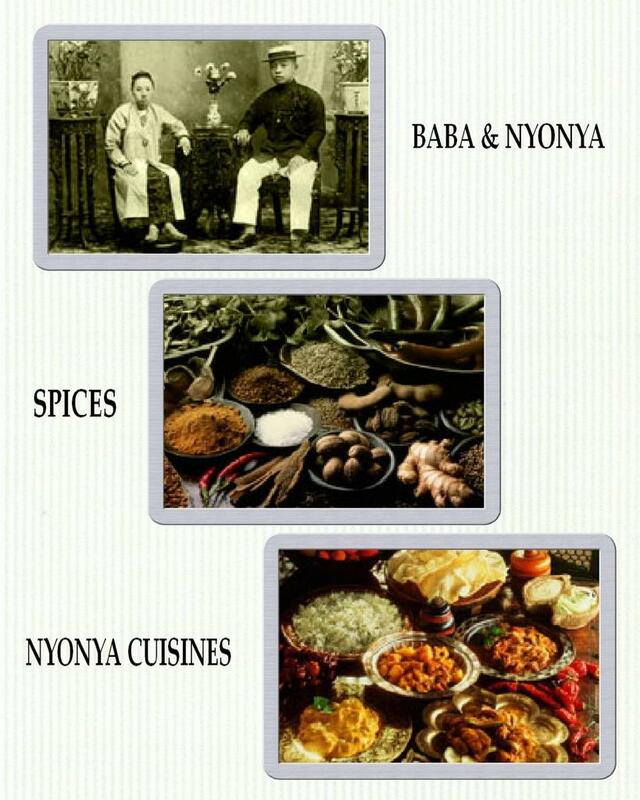 The people are referred to as the Baba Nyonya people, with Baba referring to the men and Nyonya to the women. Their food is a fusion of traditional Chinese and local food, creating a unique flavour. Native to Melaka, it has since spread to Penang and Singapore, with subtle differences in each area. More coconut and Malay spices are used in Melaka while more sour and hot Thai styles influence Nyonya cuisine in Penang. Nyonya cuisine focuses on the blending of tangy, aromatic spices, and therefore tends to require a great deal of preparation, but the results are well worth it. Specialities include brinjal curry, prawn sambal and "kueh" - these are very rich and sweet, brightly coloured cakes, sold in shops and on street corners all over Malaysia, with coconut as the basic ingredient in many forms and some with sweet potato, glutinous rice and palm sugar. Also not forgetting the "cendol", a kind a pandan flavoured jelly served in coconut milk. Brinjal curry is cooked by slicing the brinjal and seasoned it with tumeric powder, dried prawns, roasted belacan (shrimp paste), and other spices. The reason for the seasoning and spices are to add an aromatic smell to the curry and enhanced the taste of the curry. Served with hot rice and garnished with fried onions. A two person ala-carte lunch meal of 2-3 dishes can cost around RM20.00 per pax. if you were to eat at a restaurant. But if you were to order in a set meal like the Brinjal Curry rice then it will cost you around RM10.00. Usually Nyonya dish is eaten as the main meal although the Nyonya "kueh" are taken as snacks too during afternoon tea. Recommended restaurants are the Chi Ki Nyonya Bistro and the Nyonya Corner on Jalan Nagore in Georgetown, Penang. Ask for the “jiu hoo char” (stir-fried strips of cuttlefish, mushroom, and turnip), assam prawns (prawns marinated to perfection in tamarind juice), Assam curried fish (curry without coconut milk), and pie-tee (stir fried veggies in crispy edible cups). Tucking into these delights will make one think that heaven is definitely not a state of mind. Melaka boasts perhaps the most renowned Nyonya restaurant in Malaysia - Jonkers Melaka Restaurant, a beautiful Peranakan house. As you go inside there is an open air courtyard in the middle of the house where tables and seats are laid out.The setting is gorgeous and very relaxed. And there’s a modern twist on the authentic dishes. In Kuala Lumpur, the Restaurant Nyonya at Tengkat Tong Shin the heritage row is just 10mins.walk from Bintang Walk. Most of the recipes are from one of the owners’ mother’s extensive recipes. Plant roots serve as the main ingredients in the cuisine. Of all the wonderful tales brought back by Christopher Columbus in 1496 after his second voyage to the New World, none was stranger than the tale of a ball, which bounced. The people of Haiti made these playballs from the gum of a tree.Although they did not realise it, Columbus and his crew were the first Europeans to see this unique substance – rubber. It did not get its name until much later – in 1770, an eminent English chemist, Joseph Priestley, noted the ability of this substance to ‘rub out’ pencil marks, and ever since it has been called rubber in the English language. This is curious, because ‘rubbing out’ has never been an important use of rubber. We know that somehow or other Henry Wickham delivered around 70,000 seeds of Hevea braziliensis to the Botanical gardens at Kew in June 1876 so we can now consider what happened to them. They were planted in seedbeds the day after their arrival and within a few weeks 2,397 of them had germinated (rather less than the 10% subsequently claimed by Wickham). We know that 1919 of these seedlings were then sent to Ceylon (Sri Lanka) under the charge of one of the Kew gardeners, William Chapman) where there were three days of panic as no-one had arranged for the harbour dues to be paid. However, the seedlings were eventually released and 1700 survived to be planted at the Heneratgoda gardens. By 1880 it was reported that only some 300 were still alive. At the same time that the seedlings were dispatched to Sri Lanka, a further two cases, containing fifty seedlings, were sent to Singapore. These were off-loaded and left in a shed for a month before being collected – dead. In September 1876 a further 100 seedlings were sent to Sri Lanka, presumably from ‘Wickham seedling’ cuttings as no new source was known to have come into the UK until the botanist and explorer Robert Cross, whom Markham had sent to the Amazon to provide back-up in case of Wickham’s failure, returned in November of that year with just over 1000 Heveas as well as some Cearas and Castilloas. Kew gave away just over half of these but retained 400, from which about two dozen survived. We also know that 100 plants went to Sri Lanka in the summer of 1877 and a further 50 to India. In all, by the end of 1877, Kew had distributed over 3000 seedlings; vastly more than their primary stock, so there must have been considerable propagation from cuttings. Sri Lanka then forwarded 22 seedlings from that delivery of 100 to Singapore. All of these survived and Henry Ridley, Director of the Singapore Botanic Gardens, was later to remark that it was from these 22 seedlings in the Gardens that more than 75% of the cultivated plants in Malaysia were derived. Unfortunately, in spite of all the detailed records kept by Kew, one piece of information is missing and that is the source of those 100 seedlings. We do not know whether they were propagated from ‘Wickham’ or ‘Cross’ plants. Whilst many writers claim, without giving verifiable references, that they were from ‘Wickham’ plants we have the firm opinion of Henry Ridley that they appeared different form the original (Wickham) seedlings and that they were from ‘Cross plants. Whether the truth can ever be established now is doubtful but perhaps we should consider Cross, not Wickham to be the "father of the rubber plantation industry". The arrival of 22 Seedlings in Singapore did not create the Malaysian plantations overnight. Hevea seedlings were planted in the Residency gardens at Kuala Kangsar where they were nurtured by the Resident, Hugh Low whilst investigations of both Hevea and indigenous rubber-producing plants were carried out by H J Murton, the Superintendent of the Singapore Botanic Gardens, and by his successor, N Cantly. In 1885 Cantly claimed that the latter offered better commercial potential. Meanwhile, in 1884, Frank Swettenham, later to be the High Commissioner of the Federated Malay States, planted 400 Hevea seeds from the Kuala Kangsar trees in Perak. More were planted in Selangor between 1883 and 1885 by T H Hill although these were possibly ornamental rather than commercial plantings. In 1888 Henry Ridley was appointed Director of the Singapore Botanic Gardens and suggested that the Government should consider large-scale plantings, as there was little private interest in planting crops which would take 5 years or more to start paying their way. He was able to use his additional position as Supervisor of the Straits Forest Department to carry out plantings in both Singapore and around Malacca and to investigate ways of cultivating and tapping the trees for optimum yield. He published his recommendations in 1897 and, following his ideas, Curtis in Penang and Derry in Kuala Kangsar obtained yields of latex from which they were able to calculate that rubber production could be profitable. It was also noted from samples sent to England that there would be a ready market for plantation rubber as it was much cleaner and more consistent in quality than the wild rubbers of either Africa or Amazonia. It is perhaps ironic that another Brazilian commodity pushed Malaysia into rubber. Various government inducements had encouraged planters to create and expand plantations and many of these chose coffee as their main crop. The price of coffee had been high due to production problems in Brazil but, by the mid 90’s, these problems had been overcome whilst fungal disease was attacking the Malaysian plants. In 1895, Tan Chay Yan planted 43 acres of Hevea on his estate at Bukit Lintang in Malacca and the Kindersleys planted a further 5 acres in Selangor. These were the first commercial rubber estates in Malaysia and, as the coffee market collapsed, more and more planters turned to rubber. Initially the planting were interspersed with cash crops such as coffee but by 1898 Stephens, in Perak, was planting dedicated rubber plantations. At about this time Ridley noted that he had received requests for one million seeds in a single day! 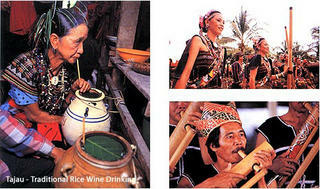 For Borneo’s rural agrarian-based population the rice harvest festival, or Pesta Ka’amatan in Sabah, is intricately connected with rice cultivation, and with the cycle of life. Rice is Sabah’s golden crop, the grain of life, and the Pesta Ka’amatan marks the end of the planting cycle. It is closely associated with religion, culture and social order. People gather in villages to thank God and the spirits for a good harvest and pray for blessings for an even better harvest the following year, very much like other harvest and thanksgiving festivals throughout the world. The life of the peoples of Borneo, not so long ago essentially that of hunters, gatherers and subsistence rice-farmers was a hard one. Preparing rice-fields, be they flooded such as the Kadazan danau, or on steep hills in the interior was an arduous task that was the responsibility of the men. The womenfolk’s’ work was not less backbreaking: clearing fields and collect firewood, weeding, looking after the seedlings, planting and finally harvesting the ripe crop. Aside from the period between harvesting and the new planting season, the work was continuous. But it wasn’t just the labour-intensive nature of rice-cultivation that caused such veneration for the cereal. Not enough rice meant famine. Over thousands of years of rice farming superstitions and taboos sprung up, and no one thanks God for rice more gratefully than the humble farmer who does not know fertilisers and herbicides. The historic buildings that were part of “Loke Hall” and now PAM Centre on Jalan Tangsi would not be standing today if not for Kuala Lumpur City Hall’s intervention in 1980s, in response to concerns from members of the public. These buildings therefore stand as continuing testimony to the City’s commitment to conservation, and PAM is honored to have been part of this effort. Since the then Mayor of Kuala Lumpur entrusted PAM with the dual status as ‘Tenant - Architect” and “Custodian” of the buildings, PAM has successfully met the challenge and fulfilled the obligation to restore, refurbish and maintain these buildings in a good state of repair. This has been possible with the voluntary efforts, and the technical expertise of PAM Members. PAM Centre is today also a model “conservation” and “adaptive reuse” project for the City, as set out in PAM’s proposition and commitment to the then Mayor of Kuala Lumpur. These days, not only is PAM is closely associated with Loke Hall in the eyes of the local communities, but also to foreign visitors that have heard and came from afar. PAM will continue to make representations to realise this vision, and is confident that with these activities at PAM Centre, as well as more spaces for galleries, outlets and supporting amenities at the adjoining properties, Jalan Tangsi will be another attraction of the city, as a precint for architecture & arts. PERTUBUHAN AKITEK MALAYSIA (PAM) is located in a historically important building in Kuala Lumpur. 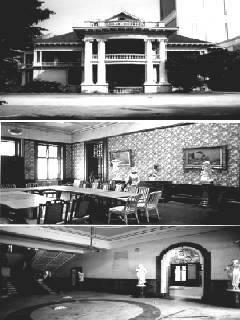 In 1909, Loke Hall was taken over by a European Group who turned it into the Empire Hotel and remained so for 10 years. Meanwhile in 1916, the ownership of Loke Hall fell to Alan Loke, son of Loke Yew. Loke Hall was renovated yet again and became the Peninsular Hotel. As Empire and then the Peninsular, Loke Hall became a meeting ground for planters and members of the trading houses until 1973 when PAM acquired tenancy of the premises on an initial 2 years lease. In February 1981, the estate of Alan Loke gave PAM notice to deliver vacant possession of the premises before 1 April 1981 as they had sold Loke Hall to Intan Development Sdn Bhd which intended to demolish the PAM Centre Building and the adjoining properties which were part of Loke Hall. The proposal to demolish Loke Hall and redevelop the site drew much public concern. PAM, conservationists and concerned members of the public made representation to the Dewan Bandaraya Kuala Lumpur (DBKL) or KL City Hall. Consequently DBKL decided to acquire Loke Hall. 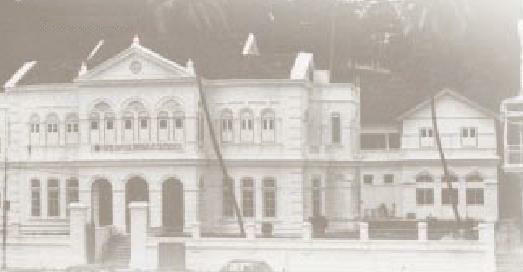 The then Datuk Bandar (Mayor) Y Bhg Tan Sri Dato’ Elyas Omar, on 24 December 1983 wrote to PAM of restoration and refurbishment works to the building. Subsequently PAM’s proposal was submitted to the Datuk Bandar and accepted. 1. More than neo-classical in styling; the north wing has a Regency flavour with its balcony terrace and eclectic features. 2. Skillfully laid out with an atrium incorporated and symmetrically composed. It was designed in heavy load bearing masonry yet adapted for tropical living. 3. Artistically built and with a high degree of the Chinese artisan craftsmanship which has since being lost. 4. The pediment, hooded moulds and fanlights, porch, oggia, blind arcade, corner quoins, Regency verandah are only a few of the many details that would intrigue conservationists and architects. 5. A major part of the whole architectural composition comprising the stables annex, nos 8, 12 and 14, up to the present Wisma Ekram. PAM in its dual status as ‘tenant Architect" and "custodian" of a building gazetted under the Antiquities’ Act has fulfilled its obligations to maintain the building in a good state of repair and restore it in the manner of a model "conservation" and "adaptive reuse" project. This historic structure would not be standing today if not for KL City Hall’s support for conservation. This building therefore stands as a continuing testimony to KL City Hall’s commitment to conservation and the personal interest of our then Lord Mayor, Y Bhg Tan Sri Dato’ Elyas Omar. PAM, originally established as the Institute of Architects Malaya (IAM) in 1920 has a history of some 70 plus years. In 1948, the name was changed to the Federation of Malaya Society of Architects (FMSA). Pertubuhan Akitek Malaysia – The Malaysian Institute of Architects, under the present constitution was registered with the Registrar of Societies Malaysia on 20 January 1967.
ala Lumpur Hotel Merlin and the first full time Administrative Secretary was engaged. 1971 The Secretariat could no longer conduct its affairs from the cramped premises at Hotel Merlin and the Secretariat moved to a complete floor of the Koon Hoe Building along Jalan Tunku Abdul Rahman. 1972 The PAM Council decided it was crucial to establish a Building Centre to serve the industry and be the base for the PAM Secretariat. 1973 In June 1973, PAM took the bold step of setting up the PAM Centre at No. 4 & 6 Jalan Tangsi. On 12 June 1973, the PAM Building Centre was launched by the Honorable Datuk Ong Kee Hui, Minister for Technology, Research and Local Government. Early writings from India speak of a place called Savarnadvipa -- the Land of Gold. This mystical, fantastically wealthly kingdom was said to lie in a far away and unknown land, and legend holds that it was on an odyessy in search of Savarnadvipa that the first Indians were lured to the Malay Peninsula. Blown across the Bay of Bengal by the reliable winds of the southwest monsoon, they arrived in Kedah sometime around 100 BC. Whether or not the civilization they encountered there was the one from the ancient chronicles will probably never be known, but it is certain that the sailors considered the trip lucrative. From that point on, and ever-growing stream of Indian traders arrived in search of gold, aromatic wood, and spices. Goods were not the only items exchanged in the peninsula's ports: the Indians also brought a pervasive culture. Hinduism and Buddhism swept through the land, bringing temples and Indian cultural traditions. Local kings, who sent emissaries to the subcontinent, were impressed by the efficiency of the Hindu courts, and soon began to refer to themselves as "rajahs." They integrated what they considered the best Indian governmental traditions with the existing structure, and historians typically refer to these kingdoms as "Indianised kingdoms." Today, the most visible example of the early Indian influence is in the Malay wedding ceremony, which is very similar that of the subcontinent. Until the 15th century, the Hindu kingdoms of peninsular Malaysia were largely overshadowed by neighboring kingdoms in Cambodia and Indonesia. The strongest of these kingdoms was called Srivijaya, and the records of Chinese, Indian, and Arab traders laud it as the best trading port in the region. It was the first great maritime kingdom in the Malay archipelago, and other ports quickly emulated its success. At some time around the 13th century, as other entrepots emerged, Srivijaya's influence declined. The lack of a strong central power, coupled with the ever-present nuisance of pirates, amplified the need for secure, well-equipped port in the region. Fate would make this port the city of Malacca. According to the Malay Annals, Malacca was founded in 1400 by a fleeing Palembang prince named Parameswara. Its rise from a village of royal refugees to a wealthy kingdom was swift. Perfectly located for trade, within 50 years it was the most influential port in Southeast Asia. At any one time, ships from a dozen kingdoms great and small could be seen in the harbor. With these traders came Islam, and Malacca's rulers now referred to themselves as "sultans." The sultans were the heads of a highly organized municipal government, whose main purpose was to facilitate trade. Every incoming ship was met by a multilingual harbor captain, whose staff would see to all the vessel's needs. There were also guarded storehouses where goods from the interior and abroad could be stored until traders arrived. Most importantly, Malacca was able to control what had always been the bane of trade in the Straits area - pirates. By building alliances with outlying tribes and ports, Malacca established a kind of regional "navy" that policed the local waters and escorted friendly vessels. With the success and power it enjoyed, Malacca came to control the entire west coast of the Malay peninsula, the kingdom of Pahang, and much of Sumatra. At the height of its power, however, fate would ruin the city as quickly as it built it up. In 1511, the Portugeuse arrived, beginning a colonial legacy that would last well into the 20th century. The Portuguese constructed a massive fort in Malacca - A Famosa - which the Dutch captured in turn in 1641. This would give the Dutch an almost exclusive lock on the spice trade until 1785, when the British East India Company convinced the Sultan of Kedah to allow them to build a fort on the island of Penang. The British were mainly interested in having a safe port for ships on their way to China, but when France captured the Netherlands in 1795, England's role in the region would amplify. Rather than hand Malacca over to the French, the Dutch government in exile agreed to let England temporarily oversee the port. The British returned the city to the Dutch in 1808, but it was soon handed back to the British once again in a trade for Bencoleen, Sumatra. The Dutch still largely controlled the region, however, and in 1819 Britain sent Sir William Raffles to establish a trading post in Singapore. These three British colonies - Penang, Malacca, and Singapore - came to be known as the Straits Settlements. While the European powers played their regional chess game, the local Malay sultanates continued on their own affairs. 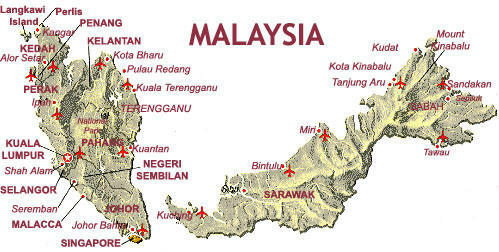 After Malacca was captured, the new Muslim trading center became Johor, then later on Perak. Both the Minangkabau Immigrants from Sumatra and the Bugi people from Celebes immigrated to the peninsula in large numbers, leavingn lasting cultural contributions. In the late 1860's, a number of Malay kingdoms began fighting each other for control of the throne of Perak, causing enough of a disturbance in the region to inspire Britain to intervene and essentially force the Malay rulers to sign a peace treaty known as the Pangkor Agreement in 1874. The treaty, unsurprisingly, gave Britain a much greater role in the region - a role it would need in order to maintain its monopoly on the vast amount of tin being mined in the peninsula. With 1957's independence, a new series of difficult decisions lay ahead of Malaya, the first of which was to determine exactly what territories would be included in the new state. In 1961, the term "Malaysia" came into being after Tunku convinced Singapore, Sabah, and Sarawak to join Malaya in a federal union (Singapore later opted out of the union, peacefully, in 1965). Afraid that the union would interfere with his expansionistic plans, Indonesia's president Sukharno launched attacks against Malaysia in Borneo and on the peninsula, all of which were unsuccessful. Another immediate problem was the determination of a national identity. Malaysia was a mix of people from many races and cultures, and uniting them under a common flag was not an easy enterprise. Because Malays represented the majority, the constitution gave them permanent spots in the government, made Islam the national religion, and made Malay the national language; but the Chinese firmly dominated business and trade, and most Malay were suffering economic hardships. The government, controlled by the United Malay National Organization, passed the New Economic Policy, which attempted to increase economic opportunity for the Malay by establishing various quotas in their favor. Unsurprisingly, many Chinese opposed the new arrangement and formed a significant opposition party. In 1969, after the opposition party won a significant seats, riots swepts through Kuala Lumpur and the country was placed in a state of emergency for two years. It was a painful moment in the young nation's history that most Malaysians prefer to forget. In the last two decades, Malaysia has undergone tremendous growth and prosperity, and has arguably made significant progress in race relations. Many attribute the country's success to the dynamic leadership of Prime Minister Mahathir bin Mohammed, who has led the country since 1981. The date is traditionally observed on the 15th day of the eighth month in the Chinese calendar. To the Chinese community, the festival is like a second Chinese New Year. Over the years, the cultural festival has become one of Malaysia’s favourite and best-loved celebrations. 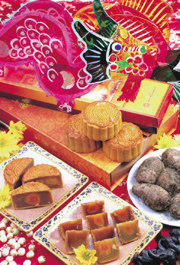 Families gather for home-cooked food and the traditional mooncakes under one roof. Legends and myths abound over the festival’s origin. One story has it that the Jade Emperor became incensed with a town’s residents for having slaughtered his favourite goose. He called upon a fierce storm to destroy them. But, a kind fairy intervened and told the people to light lanterns all over town so that the emperor would think that the town was ablaze. To this day, small towns across rural China have villagers lighting hundreds of lanterns and celebrating with thanksgiving feasts that include lion and dragon dances. Another popular tale tells of 10 suns in the sky where their combined heat nearly scorched the earth if it were not for the famous Chinese archer Hou Yi, who shot his arrows to destroy nine of the suns to save Earth. Unfortunately for Hou Yi, the suns turned out to be the sons of the Jade Emperor who banished the archer and his wife Chang O along with their children from the face of the Earth. The Western Goddess took pity on the family and gave Hou Yi an elixir of immortality. But Chang O took the whole portion for herself. As the potion worked its powers, she became increasingly lighter and floated to the sky. She sought solace and shelter on the moon where she built a palace and lived as the Lady of the Moon. People still offer prayers and sacrifices to the moon to commemorate the date - 15th day of the eighth moon. The mooncake has its own fascinating origins. The Han people rose against the Mongol rule of the Yuan Dynasty with revolutionaries led by Chu Yuan Chang. Chu's adviser Liu Po Wen came up with the brilliant idea of uniting the people secretly by distributing specially baked mooncakes with a message hidden inside. The messages read: “Revolt on the 15th day of the eighth moon”. On that day, the people rebelled against their government and were saved from oppression. Today, mooncakes symbolise families who stay united – like the people in the old days. Accessibility: Monorail(Jalan Maharajalela)-elevalated transit station right next door. 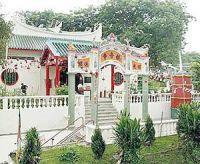 THE Guan Yin Temple is one of the few temples in Kuala Lumpur that are more than a century old. It is the oldest Guan Yin Temple in Kuala Lumpur. Entering the worship hall, one finds the central feature – a statue of Sakyamuni Buddha in a sitting posture.Alongside this is a statue of a thousand-armed and thousand-eyed Guan Yin and statues of the three Fa Zhu Gung brothers. According to a visiting devotee who wished to be known only as Allen, the Sakyamuni Buddha represents the highest level of enlightenment and is thus the main worshipping altar. “Guan Yin is the goddess of mercy who will help those who are suffering while the Fa Zhu Gung brothers are guardian deities who guard the peace,” he said. Pedestrians on the sidewalk along Jalan Maharajalela might also have noticed a pair of ominous-looking black stone lions guarding the small entrance at the bottom of the stairs. The temple has an interesting history, dating back to the time of early Chinese immigrants in Malaysia and has survived turbulent periods such as the Japanese Occupation, the Communist insurgency, as well as two fires. According to records, the Guan Yin Temple started out as a small and simple structure in 1898 as a place of worship for the Hokkien Chinese.At that time, there was a Chinese cemetery on the site that Stadium Merdeka stands today. It was surmised that the temple was originally built to serve as a spiritual comfort zone for visitors to the cemetery then. It was not until 1911 that a monk, known only as Kwang Tung, arrived from the city of Fuzhou in China to bless the temple and designate it a holy place. On March 28, 1919, the ruling British government officially confirmed the temple as a place of worship to be cared for by the Selangor Hokkien Association. The primary statues inside the temple today were apparently the result of the arrival in 1938 of a monk called Tak Chen from China’s Fujian province. With money collected from a fundraiser, the temple carried out extensive renovations with the primary statues installed inside. On Dec 24, 1963, it suffered minor damage when fire from a nearby building spread to it but was repaired later by the Selangor Hokkien Association. However, worse was to come when on Feb 13, 1989, a conflagration broke out in two neighbouring buildings and spread to the temple.This time, it suffered extensive damages with sections of the building caving in and, subsequently, the authorities declared it off-limits to the public. Again, the temple was repaired and reopened nine months later. In April the following year, renovation work began and was completed a year later at an estimated cost of RM300,000. Current temple caretaker Hooi Ming Hung, 55, told Star Metro that not one primary statue was damaged during the two fires. “It is strange but that is what happened,” he chuckled before saying that the temple nowadays was usually a quiet place unless there were celebrations such as the New Moon Day and Full Moon Day when free vegetarian lunch was served to the public. There are many legends about the origin of Kuan Yin, but this in one of the most popular. In 7th century China, a king had three daughters, the youngest named Miao-Shan. At the time of Miao-Shan's birth, the earth trembled and a wonderful fragrance and flower blossoms sprang up around the land. Many of the local people said they saw the signs of a holy incarnation on her body. While the king and queen were amazed by this blessing. Unfortunately, they were corrupt and saw little value in a child who appeared pure and kind. When Miao-Shan got older, the king wanted to find a husband for her. She told her father she would only marry if by so doing she would be able to help alleviate the suffering of all mankind. The king became enraged when he heard of her devotion to helping others, and forced her to slave away at menial tasks. Her mother, the queen, and her two sisters admonished her, all to no avail. In desperation, the king decided to let her pursue her religious calling at a monastery, but ordered the nuns there to treat her so badly she would change her mind. She was forced to collect wood and water, and tend a garden for the kitchen. They thought this would be impossible, since the land around the monastery was barren. To everyone's amazement, the garden flourished, even in winter, and a spring welled up out of nowhere next to the kitchen. When the king heard about these miracles, he decided that he was going to kill Miao-Shan. After all, the nuns who were supposed to have tormented her. But as his henchmen arrived at the monastery, a spirit came out of a fog of clouds and carried her away to safety on a remote island. She lived there on her own for many years, pursuing a life of of religious dedication. Several years later, her father became seriously ill. He was unable to sleep or eat; his doctors believed he would certainly die soon. As he was about to pass, a monk came to visit the king. The monk told the king he could cure the monarch, but he would have to grind up the arms and eyes of one free from hatred to make the medicine. The king thought this was impossible, but the monk assured him that there was a Bodhisattva living in the king's domain who would gladly surrender those items if asked. The king sent an envoy to find this unknown bodhisattva. When the envoy made the request, Miao-Shan gladly cut out her eyes and severed her arms. The envoy returned and the monk made the medicine. The king instantly recovered. When the king thanked the monk; he chastised the king by saying, "You should thank the one who gave her eyes and arms." Suddenly, the monk disappeared. The king believed this was divine intervention and after ordering a coach prepared headed off with his family to find and thank the unknown bodhisattva. When the royal family arrived they realized it is was their daughter, Miao-Shan, who had made the sacrifice. Miao-Shan spoke up, "Mindful of my father's love, I have repaid him with my eyes and arms." With eyes full of tears and hearts full of shame, the family gathered to hug Miao-Shan. As they did so auspicious clouds formed around Miao-Shan. The earth trembled, flowers rained down, and a holy manifestation of the Thousand Eyes and Thousand Arms appeared hovering in the air. And then, the bodhisattva was gone. To honor Miao-Shan the royal family built a shrine on the spot, which is known as Fragrant Mountain.